Billionaire Pierre Karl Péladeau controls 28% of shares and 73% of voting shares of Montreal’s Quebecor, the parent company of Videotron. On the weekend, Péladeau announced his plans to run for provincial office under the separatist party Parti Québécois. This move has suddenly put Ottawa’s plans for Videotron to be the fourth national wireless carrier in jeopardy, as now Quebecor’s controlling shareholder will be fighting for Quebec to become an independent country. Despite Péladeau resigning as vice-chairman of Quebecor and chairman of Quebecor Media and TVA Group on the weekend and his plans to put his shares into a blind trust if elected, many have remained skeptical about his continued influence on the company. The surprise political move has caused Videotron to be caught in the crosshairs, as according to CJAD (owned by Bell Media) customers have already started to ditch the company, switching away to rivals such as Bell. A Bell store in Cote des Neiges saw lineups over the weekend which have not been seen since the iPhone debuted, according to employee Stephanie Huttman. According to Huttman and her three colleagues, they processed 40 to 50 customers switching away from Videotron on Monday. 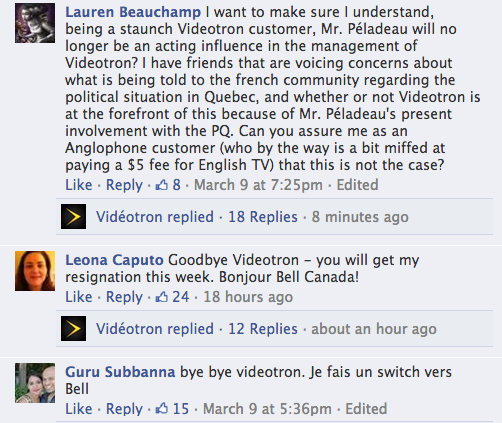 If you’re a Videotron customer—are you planning to switch away or stick with the company?